Interviewer’s Note: “Anti-Diva” Kaitlin Diemond is a Canadian wrestler who has blazed across her native county’s wrestling scene and beyond. Some Canadian promotions Diemond has worked for include Great Canadian Wrestling (GCW), Magnificent Championship Wrestling (MCW) and Pure Wrestling Association (PWA). At GCW she is the current holder of the GCW WILD Championship having won the title in May from Skylar Rose. She is a former holder of the MCW Women’s Championship. Outside of Canada, Diemond has notably worked in the United States and Mexico. Some promotions that have featured Diemond include Women Superstars Uncensored (WSU), Desastre Total Ultraviolento (DTU) and Xtrem Mexican Wrestling (XMW). Rounding out her career thus far Diemond has appeared for super promotions WWE and AAA. Diemond can be followed on Twitter @kaitlindiemond. This interview was completed on August 19, 2014. In this interview Diemond and I focus on her work for GCW. Daniel Johnson: For background purposes where and when were you born? Kaitlin Diemond: September 25, 1989, Toronto. Daniel Johnson: What is your earliest memory of wrestling? Kaitlin Diemond: My earliest memory is the Bret Hart/HBK rivalry. Daniel Johnson: When did you know you wanted to become a wrestler and how did you go about getting trained? Kaitlin Diemond: I knew from the age of 10, I attended indie shows in my area and reached out to some pros who offered to train me. I worked as a face on and off from the beginning days of my career up until now. Daniel Johnson: Does anything particular distinguish GCW from other promotions? How would you describe the women’s division in GCW? Kaitlin Diemond: The GCW has a very diverse women’s division which also sets them apart. Daniel Johnson: I saw that last year in GCW you teamed with WWE Hall of Famer, Koko B. Ware in an intergender match. What was that experience like? Kaitlin Diemond: Teaming with Koko was a great learning experience. Daniel Johnson: Earlier this year you won the GCW WILD Championship from Skylar Rose. What are your memories of this match? Kaitlin Diemond: Winning the title from Skylar Rose, I remember it being my first match back from Mexico and I was just so happy to be speaking English again. Daniel Johnson: This is not the only match you have worked with Skylar Rose. Earlier this year I saw that you also worked with her in Crossfire Wrestling (CW). How has it been working with Rose as an opponent and do you expect to work more with her? Kaitlin Diemond: I work with her often. She’s a bright young star and I hope to have many more matches with her. Daniel Johnson: In your view who have been some wrestlers you have worked with that you feel you have the best chemistry with? Kaitlin Diemond: I click best with Jody D’Milo, KC Spinelli and Serena Deeb to name a few. Daniel Johnson: What do you think makes you click with another worker? Kaitlin Diemond: For me clicking with them is very personality driven. They have to be a fast improviser and quick witted. Daniel Johnson: Are there any workers you have yet to perform with that you think in particular you could have a great match with? If so who are they? Kaitlin Diemond: I’ve yet to work with Jennifer Blake and I know we would have a solid match. I hope to face her soon. Daniel Johnson: When do you expect to have your next title defense and what do you hope to accomplish as champion? Kaitlin Diemond: I’m not sure when my next defense is, but I did defend against Skylar Rose earlier this month. Daniel Johnson: What has been your most memorable experience working for GCW to date and why? Kaitlin Diemond: My most memorable GCW experience was teaming, winning the title the first time in a tournament where I wrestled three matches at one event. Daniel Johnson: Getting into some other promotions you have wrestled for, last year you wrestled for WSU at the WSU 28 Person Uncensored Battle Royal as well as in a tag match the night before on a WSU Secret Show. How did this opportunity come about? Kaitlin Diemond: WSU offered the girls who were already booked from my area the chance to bring someone else to fill a spot with them and they decided I was deserving. Daniel Johnson: This is the only time you have wrestled for WSU to date. Do you have plans to go back at all in the near future? Kaitlin Diemond: I hope to go back if the chance presents itself again. Daniel Johnson: Speaking of WSU, this promotion is based in the United States and you have also wrestled in Mexico as recently as this year for Xtrem Mexican Wrestling. Is this the furthest you have ever wrestled from home? How did you get the chance to wrestle for this promotion and what was the experience like? Kaitlin Diemond: XMW was just one of the companies I worked for there. I’m dying to work anywhere and everywhere that I can! I’m hoping to hit Mexico again next year as well as England if possible. Daniel Johnson: How many Mexican promotions have you worked for? Kaitlin Diemond: I first worked for DTU in Mexico. I did not keep track of the number of companies I worked for. Daniel Johnson: What has been your most memorable experience working in Mexico? Kaitlin Diemond: My most memorable experiences was doing three non-televised spot shows for AAA. Daniel Johnson: Going back to your past for just a minute aside from the GCW WILD Championship you have also held the MCW Women’s Championship for nearly a year. What are your memories of this reign? Kaitlin Diemond: MCW is fun. I’m the hometown girl in the city they run and I had my first matches with Courtney Rush there. Daniel Johnson: I do not think you have wrestled for MCW since 2011. Do you have any plans to go back there again or is that not in the cards for the foreseeable future? Kaitlin Diemond: Never say never in regards to a return there. Daniel Johnson: Looking at the present how has this year been different from past years in your career? Kaitlin Diemond: This year has been different because I’m now wrestling full time again. Mexico, tours all over Canada as well as four dates with WWE. No other year has compared. Daniel Johnson: You mentioned working four WWE dates. How did these come about and when were they? Who did you wrestle with in WWE and what feedback did you get? Kaitlin Diemond: I was selected to do extra work for WWE as a Rosebud so I did two non-televised events, Raw and SmackDown. It was a dream come true. I had a tryout match prior to the SmackDown taping a with another independent wrestler from Ohio named Angel Dust. The agents and superstars that watched it all gave me extremely positive feedback. Daniel Johnson: Moving ahead what plans do you have for 2015? Kaitlin Diemond: 2015, I’m hoping will be more of the same. As long as I can continue to make a living wrestling I will continue on this path. Daniel Johnson: To close interviews I like to ask five non-wrestling related questions followed by a few more brief wrestling questions. What do you enjoy watching on TV these days? Kaitlin Diemond: Big Brother is my favorite show. Daniel Johnson: What has been your favorite movie to come out in the past year? Kaitlin Diemond: I don’t watch a lot of movies so I really can’t answer that. Daniel Johnson: Have you tried any new foods in the last year? If so what has been your favorite new food? Kaitlin Diemond: Sushi is something new I have tried and liked. Daniel Johnson: What has been your favorite song released in the past year? Kaitlin Diemond: “Rap God” by Eminem is my song. Kaitlin Diemond: The last book I read was Chris Jericho’s autobiography and I absolutely recommend it. 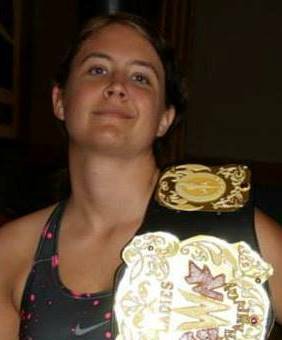 Daniel Johnson: Getting back to wrestling who are some female Canadian wrestlers that wrestling fans should look out for? Kaitlin Diemond: Fans should look out for Bambi Hall, KC Spinelli, Beautiful Beaa, Vanessa Kraven, Xandra Bale, Courtney Rush, LuFisto, Portia Perez, Jennifer Blake and Sarah Stock. I love all these girls! Daniel Johnson: Who is one wrestler 25 or younger that all wrestling fans should know about? Kaitlin Diemond: Seleyzia Sparx and Jasmin are two very young ladies getting some exposure everyone should know about them. Daniel Johnson: Ribs and road stories are always fun. Do you have any that you could share? Kaitlin Diemond: One of my favorite ribs is taking off when someone is at a stop for the bathroom or food. Hiding around the corner and seeing their face when they can’t find the vehicle for a little while. Simple, but effective. Daniel Johnson: Finally, is there anything you would like to add? Check out Kaitlin Diemond in action! In this match she tags with Koko B. Ware in GCW to take on Maurice and D-Man.